Maria Popova (@brainpicker) joined James Altucher for what he says is “totally just a selfish podcast for me…the only blog I read is your blog, BrainPickings.org.” Here are some of the most popular post to show you why. James calls her site, “a museum of the world on the internet” and Maria says this sounds about right. Her goal, she tells James, is to share something meaningful about living a meaningful life. There won’t be any Kim Kardashian pictures (though Maria doesn’t mention how she feels about these), there won’t be any listicles (though Maria isn’t opposed to lists), and there won’t be any content. “I didn’t hear you say the word content once, which is one of my pet peeves.” she tells James. Her line in the sand against content seems to stem from content for content’s sake. When she started Brain Pickings, she didn’t want advertisements because ads would own her schedule, where she became the horse rather than jockey. For a bit of content, take a recent example from the world of sports, where reporter Clay Travis guessed that NBA player Boogie Cousins would be arrested within five years. This may be the cynical content Maria was talking about. It’s hard to conceive of any self-respecting journalist or scholar or writer of integrity who would stand to call his or her work content. James says the listicle appeals to people and there’s good reason. 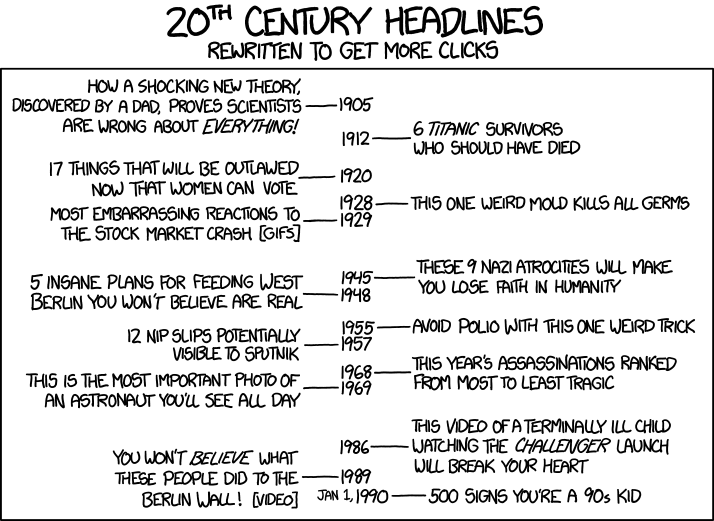 In fact, a quick Google search reveals that just about every website has a listicle about why we like listicles. This NPR list of lists was my favorite. Of course, there is an xkcd comic about this. When Maria began Brain Pickings, she wanted to create something good in a world that was becoming too cynical (what, she thinks reporters predicting NBA players heading off to jail is cynical?). “Why not build things in the world rather than tear them down.” (-click-to-tweet-) she asks James. There were these 400 student lectures halls where the professor didn’t know your name and you learned nothing about life. This sounds like the opposite of Cheers. So, working 4 jobs through college, and earning a name scholarship to help, she made it through. James asks if she ever considered dropping out of school, to which Maria replies that the thought never even occurred to her. “There’s no Bulgarian word for drop-out” she tells him. Words help clarify things for understanding. Nassim Taleb had to come up with the word antifragility to explain things that gain from disorder. Before Maria heard “drop-out” or I heard “antifragile” we never thought in those terms. After finishing school she continued to work and share emails with friends. Brain Pickings was originally just an email with three links (no description) to eight people. It started very slowly. Maria kept reading and tells James that “Learning to read well and to write well is really learning to think well.” She’s not the only one who thinks about thinking this way. Sharing what you know is one of the best ways to test your knowledge about what you know. In The Five Elements of Effective Thinking Professor Edward Burger tells the story of students who would come to his office after a low exam score. They would say they knew the material, they just couldn’t explain it. This. Is. The. Crux. If you can’t explain something well, you don’t understand it well. This is more widely known as the Feynman technique. Here Scott Young explains it. This is actually how this blog began. There was so much to learn from James Altucher’s guest, but merely listening didn’t provide enough connections for me to remember or apply it. As Maria began this learning process after school she realized that “the process is a much greater reflection of personhood than the product.” She tells James that John Steinbeck wrote two books when he wrote Grapes of Wrath, the story everyone knows and a journal about the story everyone knows. It’s in this second work that Maria has found an incredible amount of value. James tells Maria that even though we have access to everything via Google, we still struggle to find the things that light us up. Past guest Shane Snow makes the case that limited options actually help. In chapter eight of his book – Smartcuts – he writes that “constraints force us to throw convention out.” Alex Blumberg (episode #70) said something similar about time. When James asked about how he got it all done, he said that because he didn’t have all the time in the world, he chose the things that needed done. Maria was working after college, humming happily along, when a glitch in the visa system denied her citizenship application. This meant she had to leave the country, so she emigrated again, spending time in London and Bulgaria. Despite having her life pulled out from under her, there was some good to this, she tells James: “There’s often a silver-lining in these less than ideal circumstances forced upon us.” She was stuck without Amazon (yes, there are places like that) and it forced her to read books that were available online in the public domain. She kept writing and said that she was encouraged to see 100 people reading, 100 people following on Twitter. Let me take a moment to personally thank you too for reading. We’re total strangers. Only one friend of mine listens to these podcasts so everyone that reads this has no reason to except that they enjoy what’s being written here. Thank you for that, it does mean a lot. Okay, back to the interview. One of those articles was Happy Birthday, Brain Pickings: 7 Things I Learned in 7 Years of Reading, Writing, and Living. James wants to jump into a few of the ideas. Maria says she learned this in part from Andrew Sullivan, and it’s a form of intelligent thinking. Stephen Dubner writes that being wrong is one of the ways you can start to think like a freak, or at least, like him. “The three hardest words are ‘I don’t know’” he writes in Think Like a Freak. Tackling this tricky tic in true Freakonomics fashion, Duber and his co-author Levitt lay out a type of logic that says guessing is often a much better course of action. If you admit, up front, you don’t know then you always lose some credibility because of the way we view people who don’t know things. If, on the other hand, you make a guess, you have a chance of being right. Rather than saying that we don’t know what Apple ($AAPL) will do in 2015Q2, we make a guess that they’ll be up 40%. There’ s a chance that will happen. If it doesn’t though, there’s no cost for our guess, we can just walk back the position, change it, or even admit that it was a tricky situation and we did our best. James says this isn’t an easy thing to do, especially on TV, where if you don’t know or change your mind, you’ll never be invited back. In their interview James and Maria share the story of Albert Einstein telling a colleague that the awards for doing work aren’t real awards at all, the work is the reward. If you find something you enjoy doing, that’s your thing, your prize, your gold watch. The answer is no. Don’t now and never did. Yes, I’ve made a great deal of dough from my fiction, but I never set a single word down on paper with the thought of being paid for it…I have written because it fulfilled me. The grand finale is a list of books that Maria has recently enjoy and include: On Looking: Eleven Walks with Expert Eyes. In that book, Alexandra Horowitz walks down the same block with eleven different experts to get eleven different stories. This demonstrates an idea that Daniel Kahneman terms What You See Is All There Is. He writes: “information that is not retrieved (even unconsciously) from memory might as well not exist.” Our default thinking is to quickly categorize the world around us, and how we categorize those things depends on what we know (can retrieve). Other books Maria suggests are: The Faraway Nearby, The Art of Asking, A Field Guide to Getting Lost, On the Shortness of Life, Daybook: The Journal of an Artist, Anne Lamott, The Art of Stillness, Joan Didion, Waking Up, Hackers and Painters, Still Writing, Arts and Letters…this list could go on forever, you really should just head over to BrainPickings.org. Thanks for reading. Let me know where I strayed in the comments or on Twitter, @MikeDariano. Maria Popova gave a great interview with Tim Ferriss as well. There they talk about meditation and mindfulness. If you like Brain Pickings you may also like Farnam Street. The public domain is when intellectual property rights have elapsed. Generally 70 years after the death of an author. This site participates in the Amazon Affiliate program. If you follow a link from here, to there, and buy anything – a few cents of the purchase get sent to me. Thanks.